"When the Constitution was adopted many housewives still brewed small beer for their families, and for fifty years thereafter numerous village breweries continued in operation with an equipment and a volume of business hardly exceeding those of a village bakery. . . . Until 1850, however, America manufactured more spirituous than fermented beverages, and it was not until ten years later that malt liquors gained the definite ascendancy they afterwards maintained." Various factors were responsible for holding back the growth of the industry. One of these was the general lack of industrial progress in the chaotic years between the end of the war and the ratification of the Constitution, years when the country simply coasted along without any real government in control. But even after the Constitution had been accepted by the states, even after Washington had assumed the Presidency in New York and the Federalist principle had won out, industry was a long time getting started. There was not enough money for large-scale investment; the whole financial system of the country needed overhauling; the pattern of international trade had been distorted by the rupture with Great Britain. In the course of all this, the question of the manufacture of malt liquors held a curious prominence; statements about its progress, value and future were made by a surprising number of important men of the period. "We have already been too long subject to British prejudices. I use no porter or cheese in my family, but such as is made in America; both these articles may now be purchased of an excellent quality." The "10 bottles of American porter" are reassuring, but what is one to make of the "Taunton ale"? Was there one particularly eccentric guest whose taste had to be propitiated? In the years preceding his assumption of the Presidency, Washington was a steady customer of Robert Hare. Son of a porter brewer in Lime-house, Hare had emigrated to Philadelphia in 1773 with a gift from his father of £1500. He chose first to do some traveling, in order to get the measure of the colonies, and then sometime in 1774 he started (in partnership with J. Warren, also of London) brewing porter -- probably the first ever made in this country. Hare's son, Robert, Jr., took some part in the brewing business, but left it for a career of his own; in fact, he became one of the well-known scientists of the early nineteenth century. The elder Hare died in 1810, and the business was afterward conducted by people unconnected with the family. The brewers, as mentioned before, had their share in the ratification festivities in 1788. The one which took place in Baltimore on 1 May was among the first. "As soon as it was known in town that the constitution for the United States of America was ratified, and our convention dissolved, the joy of the people was extreme." The grand procession included a group of Baltimore brewers and distillers, preceded by Messrs. Peters and Johonnot. Most of the cities and towns had Fourth of July processions that year, since in many cases that date coincided with ratification. This happened in Portsmouth, New Hampshire, and Winchester, Virginia, among others. Philadelphia managed also to have its procession on that date, and it turned out to be an elaborate, lively affair. As for the brewers, they were "ten in number, headed by Reuben Haines, with ten ears of barley in their hats, and fashes [fasces] of hop vines, carrying malt shovels and mashing-oars, . . . a standard carried by Luke Morris, decorated with the brewers arms, and the motto, 'Home brew'd is best.'" Because the New York delegates to their state constitutional convention in Poughkeepsie delayed so long in agreeing to ratify, the celebrations there were held up until 28 July. On that day, though, New York had a memorable parade which "exceeded all previous demonstrations in the country." One of the brewers' flags bore this message: "May he be choaked with the grains, or drowned in hot ale whose business it is to brew mischief." There were twenty brewers and maltsters in all who took part in the procession. The motto of the brewers was "Ale, proper drink for Americans." "As the price of Porter according to your Account has not been enhanced and is good in quality, I beg if this letter gets to hand in time, that you would add another gross to the one ordered in my former letter." "The best Porter in Philadelphia" -- surely a recommendation Hare could have used to good effect, if it had come into his hands. Washington certainly appears to have favored Hare's product; sometime before November 1790 the brewery was destroyed by fire, and Washington wrote from Mount Vernon that he was sorry "on public as well as private accts., to hear of Mr. Hares loss." At the same time he judiciously instructed Tobias Lear, "You wd. do well to lay in a pretty good Stock of his, or some other Porter." It is interesting to notice that Hare's porter was ordered not directly from his brewery, but through a middleman, Clement Biddle. The latter, an experienced importer and merchant, would have all the facilities for shipping such merchandise out of Philadelphia. Clearly, the brewer at that period, even a successful brewer like Hare, concentrated on producing the beer, and left the delivery or shipment of it to an agent. 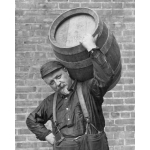 He probably had his own round of calls to neighborhood customers and taverns; in the nineteenth century, brewers maintained large stables of horses for just this reason. But the shipping of beer outside the city in which it was brewed was almost always undertaken by a commission agent of some sort -- a scheme which gradually developed into the modern system of delivery by distributors. "Before we leave this, we shall send several other matters round, but whenever they are shipped you shall have notice thereof that they may he taken from Alexandria so soon as they arrive there; at which time procure a groce of good Porter to be taken down along with them. In the meantime, have a few Bottles of Porter there, and some wine for particular company, who may be particularly recommended to you by myself." Washington was procuring his porter during the early 1790s from another brewer in Philadelphia, Benjamin Wistar Morris. One of the many brewer descendants of Anthony Morris, Benjamin advertised as early as June 1788 that he bottled and sold "Philadelphia Porter, Beer and Cyder . . . at the corner of Dock and Pear sts." This must have been the brewery built in 1745 by Anthony Morris IV -- the location chosen because of springs which were found on the property. Read George Washington's Personal Beer Recipe.